Man buried for four hours in 4' deep mud: thixotropic, rheoplectic, or something else? An amazing event and rescue in Atlanta, Georgia, was briefly on the CNN.com news this morning. It's not clear how the story was pieced together yet, and the rescuers have no idea of the identity of the man involved or how he came to be stuck in mud. 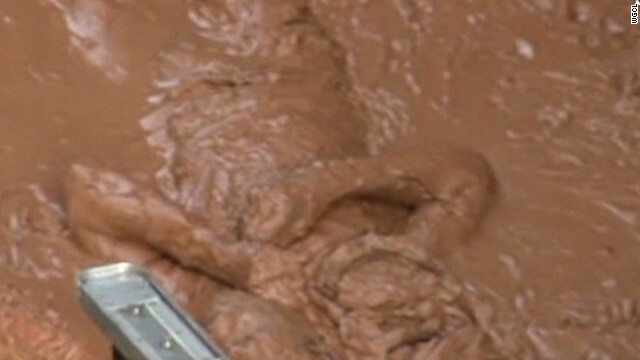 At a construction site, there was a pool of mud estimated to be four feet deep. It appears that the man did not fall from the site, because it would have been a 30' fall and, aside from his mud trauma, had no other injuries. He apparently wandered into the mud, and struggled to get out of it for a few hours before succumbing to cold and exhaustion (it was 50 F) in Atlanta this morning. Rescuers could not reach him without danger of becoming trapped in the mud themselves. Eventually a female paramedic reached him and kept his airways open until rescuers, using boards from the nearby construction site to fashion a bridge out to him, were able to pull him out. The video above shows his rescue, and he is apparently doing fine in the hospital. The video compared this situation to quicksand, but I'm not sure that the analogy is correct. Quicksand is an example of a "thixotropic" fluid, one that starts as a solid and becomes weaker when it is shaken, aggitated or stressed. If my interpretation of the video is correct, this mud became stronger as he struggled so it may be an example of a "rheopectic" material, one whose viscosity increases the longer it undergoes shearing. Such materials are fairly rare, but of increasing interest in military and sports applications where a major goal is to create materials that reduce the stress due to impact. For instance, a shoe that incorporates rheoplectic materials in its cushioning might help protect the feet of runners, jumpers, and hurdlers. Helmets and body armors with such materials would reduce body trauma from projectiles. Or it may be some other wonderful wierd behavior! Readers comments welcome! I have seen river meanders in a number of different settings--along the relatively flat stretches of rivers in the Midwest of the U.S., in bedrock along the Colorado River in Arizona, and, most impressively, in the famous Goosenecks of the San Juan River. These meanders were clearly formed at an earlier time and, we often presume from theories of river meandering, on nearly flat, erodible ground. They are also meanders that I've only seen by river rafting and hiking through the desert terrain of the Southwest. Tonight I sit in acomfortable apartment at Durham University (England), wrapped in a river meander that has played a role in history. The river in view from my apartment window flows in a stately manner that we would call "subcritical" in the hydraulics terminology. Rowing teams are practicing on the flat water for competition, which culminates for northern England on the second weekend in June with the championships. The enclosed ground, far from the isolated desert peninsulas in such settings in the Southwest, comprises the city of Durham, a World Heritage site for its culture and geography. It is a very different perspective to be sitting in a comfortable apartment high on the bluffs on the peninsula enclosed by the meander than to be camping on a beach at the base of such bluffs! The meander looks, at first, like a classic incised meander--formed earlier in time on flatter land, and then incised into underlying bedrock as the land was lifted through tectonic processes. But, unlike the meanders in the American southwest, this meander has survided glaciation. How did that happen? We think of glaciers as giant bulldozers that flatten, or at least, subdue, the high ground that they traverse--the American Midwest. The ground of the peninsula enclosed by the meander is anything but flat--so steep and hilly that in the few days that we've been here, we've only seen one bicyclist (leaning hard on her brakes as she went downhill). Everyone walks instead of cycles! How did all this topography survive the glaciation? It is strikingly different from our glaciated Midwest. Glaciation in this area reached its peak about 18,500 years ago. The glaciers receded starting about then, but paused right here where I am sitting as a guest of Durham University about 14,000 years ago. I can see that I might like to stay in this fantastic place for 500 years, but why would a glacier pause here for that long? The answer will, hopefully, be in a future post! 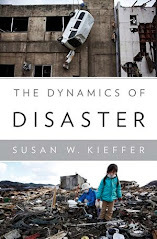 Readers might enjoy this geographer-at-large blog! Galactic Champagne: bubbles, star formation, pretty pictures, and citizen scientists! More than 35,000 "citizen scientists" have identified 5,000 "bubbles" in images of our galaxy. (Wouldn't it be wonderful if even a fraction of these people found this blog!!) Their work has increased the number of such objects that have been identified by a factor of 10. More details about the Milky Way Project can be found here by following the "Click here" link. According to the statistics listed at the bottom of the page, 527,000 images have been examined, and 662,000 bubbles have been drawn. Each citizen scientist takes an image, and draws circles, arcs, fractions of circles, and identifies other features, using a special drawing program, not unlike many of the commercial drafting packages, just customized to this specific effort. A special tool allows the researcher to draw a circular band around an object, center it on the object, alter the width of the band, and change its shape (e.g., toward an ellipse, or to allow an indent on some segment of it). Since circles may overlap, other tools allow fractions of a circle to be identified. After doing this, the researchers can flag the image as one of their "favorites", and move on to another image. It all seems like great fun, which is at least partially what science should be about! I don't know if they are still accepting new citizen scientists into the project, but details are on the link provided in the first paragraph. Each citizen scientist creates an edited image showing the circles and segments that they have identified. These are laid on top of each other to create a so-called "heat map," the middle image above. Features that have been identified by many users then jump out as being the brightest on the heat maps. At least five volunteers must flag a "candidate bubble" before it is included in the final catalogue of bubbles (right). The brightness of the bubble in the catalog is determined by its "hit rate," the fraction of users that traced it out (for some reason, this reminds me of a beauty contest, with elements of both beauty and popularity....). The faintest ones in the image above were identified by about 10% of the researchers, the solid ones by 50% or more. The data come from two instruments on Spitzer: the Spitzer Galactic Legacy Infrared Mid-Plane Survey Extraordinaire (fortunately abbreviated to GLIMPSE--and makes me appreciate the addition of "Extraordinaire" to the instrument name! Someone has a sense of humor), and the Multiband Imaging Photometer for Spitzer Galactic (MIPSGAL) surveys. Spitzer is a space telescope launched in 2003, the "final element in NASA's Great Observatories Program." The wavelength covered is 3-180 microns, that is, in the infrared region of the spectrum. It catches thermal radiation emitted from objects. Spitzer is, currently 161 million kilometers from the earth. 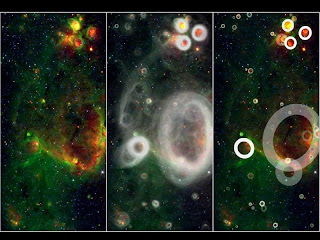 Young, hot stars blow bubbles into the gas and dust of the Milky Way. What are the bubbles? Interestingly, the press release doesn't discuss this at all, and although the press release gives the "authors of the paper," it doesn't say what paper, or where it was published. (Grrrr....come on, press offices, at least give us a hint...). As far as I can tell, when young stars coalesce out of the spinning gas and dust in the galaxy, they collapsing in on themselves due to their own weight. This process generates heat and sets up the combustion in the young stars. Excess material appears to be shed in order to slow down the rotation of the clump, and to prevent it from breaking apart. Traditionally, it was thought that the stars shed this material in the form of a pair supersonic jet streams, not as spherical bubbles. Now it appears that the bubbles may be the excess material. 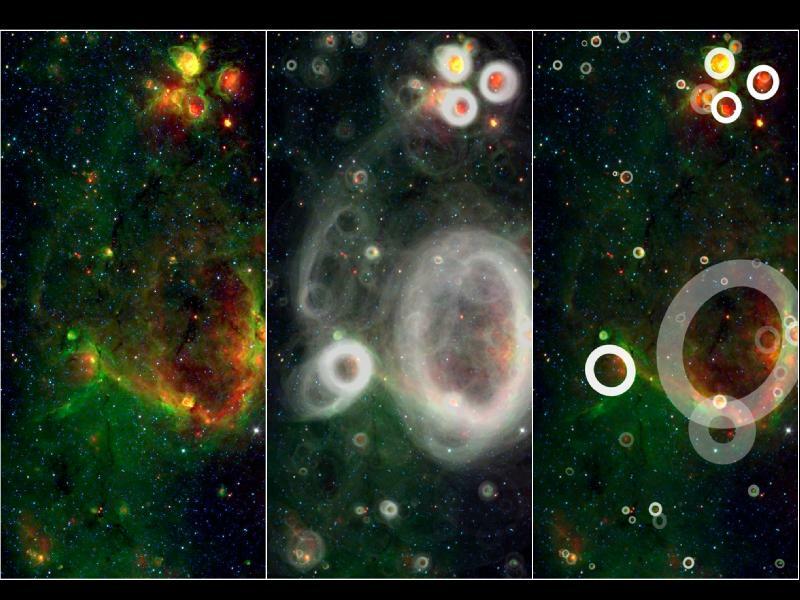 The distribution of bubbles in 3-D is interesting and potentially provides hints about structure in the Milky Way. For example, there are more bubbles off-center of the Milky Way than in its center. This has surprised the scientists because they expected star formation to be strongest where the most dense gas is, that is, at the center. This is a fairly new and exciting area of astronomy (the last 5 years?) and is clearly going to take me more time for me to sort this out. X5-class solar flare on its way! A huge X5-class eruption at 00:28 UT, March 7, is heading toward earth (a mild storm had already started prior to the X5 class one). This CME is coming out of sunspot group 1429. X-class flares are major events that can trigger "planetwide radio blackouts and long-lasting radiation storms." On another scale (of magnetic field intensity? ), the Kp-index, this is a 5-6 event. A Kp index of 5 or greater indicates storm-level geomagnetic activity. These storms, in turn, are associated with charging of surfaces on satellites, and with increased atmospheric drag on satellites as the atmosphere inflates under the influence of the event. 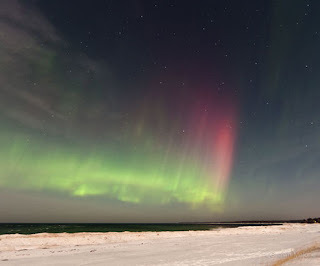 The CME is expected to reach earth on March 8th at 0625 UT (+/1 7 hours). If I'm doing my time-zones right, that's about 10:25 p.m. tonight Central Standard Time here in Illinois. This was the strongest CME in 5 years. Have already had high-frequency radio blackouts, could have power grid outages... This is kind of a fun, "energetic" description of the "sun going 'boom;!" Yesterday was a grim day for the midwest and especially southern Illinois. The midwest was hit by a huge storm system that spawned several tornados, one of which was an intensity F4 out of the scale of F5. 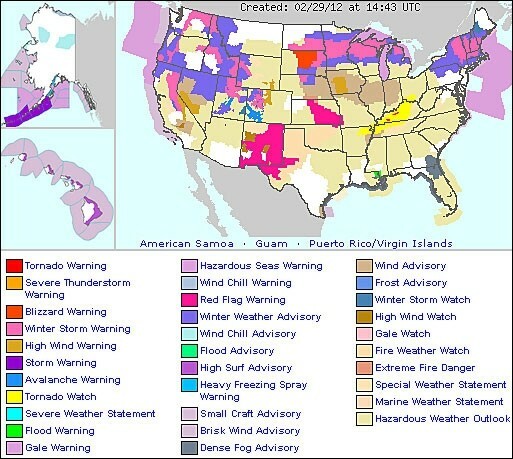 (Notice the yellow area on the NWS map to the left.) 12 people have died, and several hundred were injured. Six people were killed in the small town of Harrisburg, IL. In an eerie similarity to events last year in Joplin, Missouri, the medical center in Harrisburg was severly damaged by the tornado. Three of the deaths were in Missouri, and three in Tennessee.Tornados were also reported in Kentucky, and winds in excess of 100 mph were reported in northwestern Alabama. This has been one of the wierdest winters I've experienced in my 10 years in Illinois--nearly snowless and warm. Yesterday it was 56 by 8:00 in the morning as the winds blew (very strongly) up from the Gulf of Mexico--that's the dark brown area extending through central Illinois and Indiana. 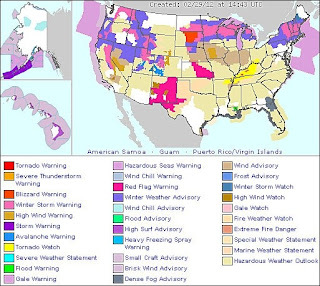 On the other hand, not all that far away, Michigan got hit with snow and freezing rain (pink and purple areas up near Canada). I have always wished that weather maps didn't stop at the border--friends in Toronto were also getting walloped by snow and freezing rain. Here's a handy reference: a map of temperature extremes for whatever days you want to specify from Weather Underground. It's showing record high temperatures in the mid-west, and record cold temperatures in the southwest and northwest. It was just created this week by Dr. Jeff Masters to allow viewers to look at record extremes, both in the US and internationally. Instructions for using it in detail are under Masters blog entry on the lower right adjacent to the map.